When Pan Feng damages a character with an attack, he can select one of their equipped cards and place it in his hand or discard it. Note that "Mad Axe" activates on a per-instance basis. 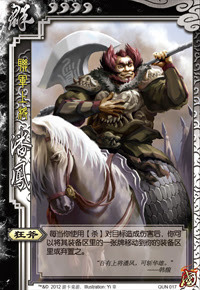 For example, if Pan Feng does multiple units of damage to one character with an Attack, he can only activate "Mad Axe" once. If Pan Feng damages multiple characters with an Attack (such as when he damages several chained characters with an elemental Attack), he can activate "Mad Axe" on each damaged character. In fact, if he damages himself in this way, he can activate "Mad Axe" on himself. "Mad Axe" is powerful because it simultaneously robs an enemy of one of their pieces of equipment while allowing Pan Feng to acquire it. Essentially Pan Feng gets a free non-Negateable Steal on an enemy's equipment when he damages them with an Attack. "Mad Axe" is wonderful when Pan Feng damages multiple enemies that are chained together with an elemental Attack. Many weapons work well to help Pan Feng more frequently activate "Mad Axe," including the Crossbow, the Axe, and the Green Dragon Blade. One must always keep in mind all of the criteria that must be met in order for an ability that requires a character to damage another with an Attack to work. In order for Pan Feng to activate "Mad Axe," he must have an Attack, he must be able to reach an enemy in his attacking range, the enemy must not have an Escape or a shield that will render the Attack useless, and the enemy that Pan Feng wishes to hit must have a piece of equipment in their equipment area. All of this seems obvious, but remember that all conditions must be met for the ability to work. As a result, the abiliity will not be activated as frequently as one would think, especially since some enemies will save their Escapes for Pan Feng or keep equipment in their hand instead of placing it in their equipment area. Like Pan Feng's "Mad Axe," Ma Dai's "Sneak Attack" and Xu Sheng's "Broken Arms" also require the character to damage another with an Attack, but the effect of these abilities are much more significant than that of "Mad Axe." Chen Gong - Chen Gong's "Brilliant Scheme" allows him to supply Pan Feng with Attacks or equipment (such as the weapons listed in the 'Strengths' section) while simultaneously allowing him to attack a character in his attacking range. This will allow him to activate "Mad Axe" more frequently. Yu Jin/Liu Shan/Zhen Ji/Younger Zhuge Liang/Zhang Jiao - These characters have abilities that protect them from Attacks and it is difficult for Pan Feng to activate "Mad Axe" on these characters. Sun Shang Xiang/Ling Tong/New Ling Tong - These characters have abilities that activate when equipment leaves their equipment area. As a result, "Mad Axe" is not as powerful when used against these characters. King Pan Feng is a poor king choice. He does not have any defensive abilities. Loyalist Pan Feng is a serviceable, but not outstanding loyalist. "Mad Axe" is useful when he can activate it against rebels, but there is little else he can do. Rebel Pan Feng is a serviceable rebel. "Mad Axe" is useful against the king, especially if he has equipment and he is worn down with few Escapes from several other rebels attacking him. Spy Pan Feng is a poor spy. "Mad Axe" is not powerful enough to change the game quickly. Pan Feng's transition from Kingdom Wars to regular San Guo Sha was a little rough. It is obvious why "Mad Axe" is an attractive ability in Kingdom Wars, as Pan Feng can be paired with Lu Bu, Ji Ling, and Pang De to make him be able to attack more frequently or to increase the power of his Attacks. However, "Mad Axe" is not powerful enough on its own to warrant his usage.